Poet Amorak Huey: I honestly wasn’t sure what to expect. This isn’t my most visual poem. Ringmasters and circuses offer some iconic possibilities, perhaps, and the cinderblock sky of the opening couplet was an image that pleased me. From looking at Meghan’s earlier Broadsided pieces, I figured she wouldn’t be too literal—too “matchy-matchy” as they say on Project Runway. I was excited to see what she’d come up with, and I was not disappointed. Artist Meghan Keane: I was, and continue to be, inspired by how complicated the imagery was to consider in visual form. It was a bit dark, enigmatic, frenetic yet motionless (“unable to be still” yet “drowning”)… I was actually very drawn to the aspects of the poem that represent the less polished part of human experience, a more truthful depiction of a complete life. Poet Amorak Huey: I knew the poem isn’t the cheeriest thing ever written, but I was struck immediately by the tension—frustration? anger, maybe even?—on the right side of the page. I love the messiness of it, the scribbling-out of it,—and I also love the brightness of the red at the left hinting at something more vivid happening off the page, in the way that the ringmaster’s circus life, inside the ring, happens outside the poem. Artist Meghan Keane: I was surprised at how well the two seemed to belong together; they played off of each other well, as if partners in this sort of behind the scenes darkness, or cohabitants of a frank, pessimistic psychological space. I think the expression of each is heightened having them together. It would be a treat if the poet might think so as well. Poet Amorak Huey: I don’t know that I was especially surprised by any part of it. I tried to keep an open mind about the particulars of the visual art, so I had no especial expectations beyond expecting to love it. Which I do. Artist Meghan Keane: I began these monoprints with repeating lines. There was something in the mesmerizing aspect of the poem, being trapped in a certain state, like the shark and the people in the poem, that kind of launched the work. Drawing square, within square, within square…. The color came after. The red grew out of a strong sense of violence, but not meant to be “bloody”… more of a gesture that ruptures, to visually articulate a general malaise… no other colors resonated with me. It was this red in particular. Poet Amorak Huey: I wrote a poem about an unfinished painting of St. Jerome by Da Vinci. I liked the process a lot—the interpreting of someone else’s work from one medium to another, almost like translating—but I have the sense the poem didn’t turn out very well, alas. If you had to represent the Broadsided of “The Ringmaster Answers the Phone” with one word, what would it be? Poet Amorak Huey: Lots. Always. Mostly poetry: Timothy Donnelly’s Cloud Corporation. Traci Brimhall’s Rookery. Among others. Also, Caitlin Horrocks’ book of short stories, This Is Not Your City. Artist Meghan Keane: I am working through Chekhov’s plays, since purchasing a book featuring his eight most famous works. His satires are actually quite hard to read without actors in front of me, I discovered. But it has been a delight to get to know the extended pieces he is most famous for: The Seagull, Uncle Vanya, etc. I love reading works by Russian writers in winter. It is a pleasure similar to this poem; a bit dark, but the truth is redeeming (for the reader, although not necessarily for the characters!). Poet Amorak Huey: I recently discovered the paintings of Mab Graves. Love! In fact, there’s one image I want to be the cover of my circus-themed chapbook (which includes this poem), if a publisher takes it and lets me choose the cover. Artist Meghan Keane: I spent the day browsing the Joan Mitchell Foundation website. I recommend looking at their grant recipients. It is an impressive array of contemporary work from under-recognized artists working in painting and sculpture. Poet Amorak Huey: I love the Broadsided project. Love anything that puts poetry into places it might not normally go. So thanks for letting me be a part of it. And thanks to Meghan for such lovely work. 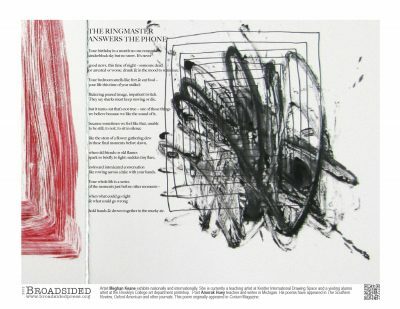 Artist Meghan Keane: Thank you Broadsided for taking me up on the proposal to custom design the composition of the artwork (two monoprints) and the layout of the final piece with the poem. It is always a treat to collaborate with great poets and open minded publishers! Poet Amorak Huey recently left the newspaper business after 15 years as a reporter and editor. He now teaches creative and professional writing at Grand Valley State University in Michigan, where he lives with his wife and two children. He holds an MFA in creative writing from Western Michigan University. His poem have appeared in The Southern Review, Oxford American, Subtropics, Indiana Review, Crab Orchard Review and many other journals. More information is available at his website: www.amorakhuey.net. Artist Meghan Keane exhibits nationally and internationally and her works can be found in private collections throughout the United States, Latin America, Europe and Japan. Recent projects include a solo exhibition, “PROJECT NIHON / sustainable art travel,” in Tokyo; a group exhibition, “Casa de Munecas” in Quito, Ecuador and “do it yourself candide,” which Keane was invited to create for the New York Public Library (january 2010). Keane is the founding director of meghan.keane.studio (meghankeanestudio.com). She is also currently a teaching artist at Kentler International Drawing Space and a visiting alumni artist at the Brooklyn College art department printshop.